HURRICANE — A 58-year-old Hurricane man was taken into custody Sunday by Hurricane City Police after driving on the wrong side of the road on a residential street, losing control of his car and destroying three utility boxes. Just after 1 p.m., Hurricane City Police Sgt. Brandon Buell said, a man was driving on the wrong side of the road when he apparently lost control of his 2004 Cadillac and ran over three utility boxes — an electricity box, a cable box and a telephone box — at 877 N. 225 West in Hurricane. The Hurricane Valley Fire Department responded to the incident to make sure there were no issues with utility outages. None were reported. “After further investigation, they suspected that the driver was under the influence,” Buell said. Tests were conducted, and the driver was arrested. 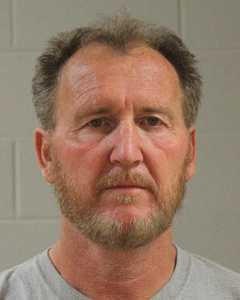 According to information from the Washington County Sheriff’s Office, Danny Miller, of Hurricane, was booked into jail for driving under the influence of prescription drugs, driving on a suspended license and improper lane travel. As this report is published, Miller is being held on $2,420 bail at the Washington County Purgatory Correctional Facility. dang creep! shud of took a cab! He’s not a creep, he’s actually a really good guy who made a bad choice. You shouldn’t judge people you do not know. u shud of called him a cab then!!! In that case, let him out of jail and give him a fundraiser! Thankfully it wasn’t a person. It wouldn’t be the same! You are right, he shouldn’t be behind the wheel, I will let his wife know that it’s her fault for not taking the keys with when she died from cancer. Yeah! Oh its also not Harold’s responsibility to have a conversation with him just because he said he is a good guy who did in fact make a bad choice, so don’t judge what you don’t know! He should not even been driving. He almost ran over his neighbor, he ran over 3 utility boxes, one was a power box, he had no drivers license, it was revoked last year, He was under the influence of medications, he went to jail as he should. Where did it say that he almost ran over his neighbor? I hope none of YOU live in glass houses because you seem to be throwing some big rocks. When you actually know the whole story please feel free to share. But until then you can at the very least keep the name calling and the shoulda woulda coulda to yourselves! Ok, FUNBAG, he is not a “creep” or a “tweeker” So shut up since you don’t know what you are talking about. Also, if you are going to comment, you SHOULD learn how to spell.